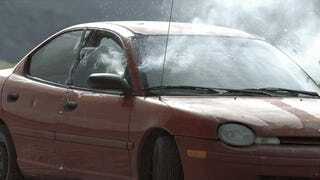 What Happens When You Test A Minigun On A Car? Explosions. That's what happens when you test out a helicopter-mounted minigun against a car. The video comes from the YouTube channel Rated RR, showing off what movie action sequences look like in real life. In this case the scene was out of Lone Survivor. The helicopter was a Huey, the minigun was a Dillon Aero.